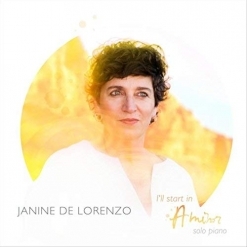 A Classical Christmas Courtship is the second solo piano release from pianist/composer Janine De Lorenzo following her 2018 debut, I’ll Start in A Minor. A native of Australia, Janine is no newcomer to the music world! Classically-trained from a young age, she has taught music and piano both privately and in classrooms. After accompanying an all-female cabaret-performing group, Janine started composing soundtracks for live theater, films and television. In 2003, she was offered a position with Cirque De Soleil as keyboard player for “KA” at the Las Vegas MGM Grand, a position she held for eight years. Just after being offered the position of Musical Director for a traveling show for Cirque, a devastating fall on ice required Janine to take a year off to heal and to rebuild the strength in her fingers and wrists so she could play again. Janine returned to Cirque and toured with “Amaluna” before deciding to channel her creative passions into her own music. Lucky us! Janine explains the origins of A Classical Christmas Courtship: “I wanted to create and play something unique and special for my audience and the idea of combining a Classical piece along with a Christmas song seemed like the perfect gift for them. I revisited some of my favorite Classical pieces, and introduced each of them to a Christmas song to see where this courtship would lead them. Each Classical and Christmas song weaves in and out of the other, as if walking hand in hand, leaving two sets of footprints in the snow.” The collection includes eleven medleys and one original composition, all played in a peaceful style that will add a calming touch to your holidays. Some of the pairings seemed almost impossible when I saw the list of songs, but they are all beautifully thought out and each is perfect in its own way! The album begins with Pachelbel’s “Canon” and Leonard Cohen’s “Hallelujah.” Really? It’s a wonderful combination and Janine plays it in a warm, flowing style that is poignant and heartfelt. Mozart’s “Sonata in C” weaves in and out of “Good King Wenceslas” - light, sweet and totally charming! Bach’s “Jesu, Joy of Man’s Desiring” pairs perfectly with “Joy To the World” - lighthearted and joyful. Another combination that had me scratching my head was Debussy’s “Clair de Lune” and “The First Noel,” but it’s a track that makes me think of a peaceful night with the moon shining on fresh snow - love it! “Nearer My God to Thee” and “Carol of the Bells”??? Both are played very gently and smoothly - absolutely gorgeous! The biggest surprise for me was the combination of Erik Satie’s “Gymnopedie #1” and “Deck the Halls.” “Deck the Halls” is very slow and graceful (like its partner), so you have to listen for it, but the piece is stunning! The album closes with Janine’s own “December Snow,” inspired by watching snow gather and build up in the branches of a tree outside her window. Slow, very open and haunting with a surprise at the end, it’s the perfect closing to a perfect album! 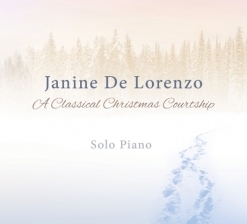 A Classical Christmas Courtship is available from www.JanineDeLorenzo.com, Amazon, iTunes and CD Baby. This one will be on my Favorites list for the year! MainlyPiano.com - All reviews by Kathy Parsons except where noted. Website design by NeuCart Redesign Services. • Read about this site's redesign here.